This law has been ascribed to Willie Sutton, a famous bank robber. When asked why he robbed banks, he reportedly said, “Because that’s where the money is.” In the radiographic evaluation of appendicular arthropathies, the “money” is generally in a relatively small handful of disorders. Even though over 90 different rheumatic diseases are recognized by the American College of Rheumatology, only three entities are commonly seen in most clinical radiology practices, even including those located in large tertiary medical centers. Osteoarthritis (a.k.a. degenerative joint disease) is the most commonly seen form of appendicular arthritis. The other two commonly seen arthropathies are rheumatoid arthritis and calcium pyrophosphate dihydrate (CPPD) deposition disease. Less common arthropathies that may manifest radiographic findings in the appendicular skeleton include septic arthritis, and gout. Most other appendicular arthropathies are seen only rarely. In George Orwell’s Animal Farm, it is stated that “All animals are equal. But some animals are more equal than others.” This principle is manifested in the appendicular arthropathies, where some radiographic findings are quite specific and can quickly lead one to the correct diagnosis. Other findings are less specific and are usually unhelpful in ordering one’s differential diagnosis. In a diarthrodial joint, osteophytes are the sine qua non of osteoarthritis. Osteophytes can be seen in both primary and secondary osteoarthritis. Osteophytes can also be seen at various entheses (sites of tendinous or ligamentous attachment to bone), often due to altered or increased stress there. In general, the presence of erosions bespeaks some type of inflammatory disease, whether the erosions are due to synovial hypertrophy, crystalline deposits, or infection. In rheumatoid arthritis, the erosions follow the development of an inflammatory proliferation of the synovium, called pannus. As this pannus increases in amount, it begins to cause erosions of the chondral surface. As the pannus increases further in amount, one begins to see erosions at the periarticular “bare” areas. These “bare” areas refer to bone within the synovial space which is not covered by articular cartilage. The articular cartilage tends to protect the bone that it covers. 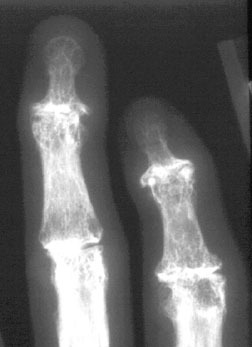 The marginal “bare” areas are not covered by cartilage, and the earliest erosions of rheumatoid arthritis are seen here. If the inflammation proceeds unchecked, the erosions of the bone and the cartilage may become profound, and the joint may finally undergo fibrous ankylosis. The presence of crystal deposits (chondrocalcinosis or tophi) indicates one of the crystalline arthropathies. In calcium pyrophosphate dyhidrate depostition (CPPD) disease, the most common site of radiographic calcifications is in fibrocartilage and hyaline articular cartilage (chondrocalcinosis). However, calcifications may also be seen in the joint capsule or synovial membrane. In gout, erosions are caused by tophi. These tophi may be either intra- or extra-articular in location. Calcifications are occasionally seen in tophi. The erosions of gout may appear very similar to those seen in rheumatoid arthritis. However, in gout, there tends to be early sparing of the articular cartilage between the erosions, while the cartilage is thinned much earlier in the course of rheumatoid arthritis. Other findings, such as joint space narrowing, subchondral cyst formation, sclerosis, ankylosis, or subluxation are not especially specific and may occur in a wide variety of degenerative or inflammatory disorders in the appendicular skeleton. It is important to describe these findings, as they tell us a lot about the severity of the patient’s disease — it’s just that they don’t tell us a whole lot about what specific disease is causing them. It would be nice if one could start with a few basic pathophysiological axioms, and from these first principles go on to deduce the characteristic sites of joint involvement of the various appendicular arthropathies. Unfortunately, such principles remain obscure, forcing one to memorize empirical patterns. However, once learned, these patterns can be helpful in ordering the differential diagnosis. Although such patterns have been described for most of the appendicular joints (Resnick, 1995), the most specific of these patterns of joint involvement are seen in the hands and wrists. Less specific patterns are seen in the hips and knees. Any joint in the body can be affected by secondary osteoarthritis due to trauma, infection or another arthropathy. However, the findings of primary (idiopathic) osteoarthritis are usually seen in the distal interphalangeal (DIP) joints of the hand, and the first carpometacarpal joint and scaphotrapezial joint of the wrist. 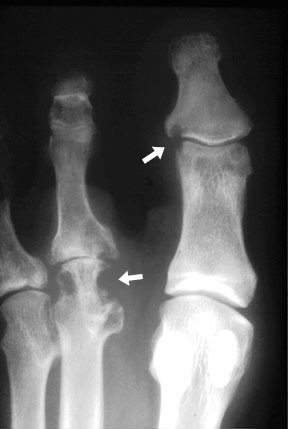 The proximal interphalangeal (PIP) joints may occasionally be affected. Rheumatoid arthritis(RA)tends to involve the PIP and metacarpophalangeal (MCP) joints of the hand and all of the major joint compartments of the wrist (pancarpal involvement). 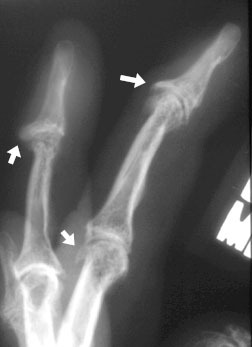 CPPD deposition disease usually initially affects the radiocarpal (RC) joint in the wrist, but may also involve the MCP joints of the hand. Age and gender may occasionally be useful in narrowing the differential diagnosis of the appendicular arthropathies. For example, the most common arthropathies in children are juvenile chronic arthritis and septic arthritis, while entities such as rheumatoid arthritis, osteoarthritis and CPPD arthropathy are generally seen in older adults. CPPD arthropathy affects both genders equally. Rheumatoid arthritis has a moderate female predominance, as does osteoarthritis in the older age group. Gout, on the other hand, has a moderate to strong male predominance. Other demographic factors, such as home location, occupation and even ethnic subtype can occasionally be helpful in steering the differential toward or away from certain disease entities. In the first two years of medical school, one is taught to take historical points and physical findings and to put them together into onediagnosis which explains everything (the law of parsimony). However, once one reaches the ward rotations and opens a patient’s chart to the problem list, one sees that most real patients have several disorders going on simultaneously. By the time one gets out of medical school, into radiology, and begins to interpret joint films, this lesson often seems to have been lost. In real life, patients often have more than one arthropathy. This is most commonly seen in patients with secondary osteoarthritis superimposed upon some other arthropathy. Virtually any arthropathy which causes cartilage loss can lead to secondary osteoarthritis, with all of the classic signs of osteoarthritis, including osteophytosis. In fact, in certain patients, the changes from the primary arthropathy may be significantly obscured by the secondary osteoarthritic changes. A clue that this is happening is that the most distinctive sign of osteoarthritis, osteophytosis, is often fairly minimal compared to other findings such as joint space narrowing or subchondral sclerosis. In fact, this is a very common presentation of rheumatoid arthritis of the knee: marked joint space narrowing and subchondral sclerosis, but no evident erosions, and only minimal osteophytosis. In primary osteoarthritis, on the other hand, marked joint space narrowing is usually accompanied by moderate or marked osteophytosis. Other combinations of arthropathies are possible, such as gout and CPPD, gout and RA, RA and DISH (RADISH), etc. Therefore, when apparently contradictory findings are noted, remember that the law of parsimony is often broken. The five simple principles listed above are neither absolute nor comprehensive, and they should not be followed dogmatically. Relying solely on them for the diagnosis of arthritis would be like using only the rule “buy low, sell high” to seek wealth. However, these principles form an effective framework for the diagnosis of most of the cases of appendicular arthropathy which one actually sees in a clinical radiology practice, and can be very helpful in elucidating the cause of even radiographically complex arthropathies.